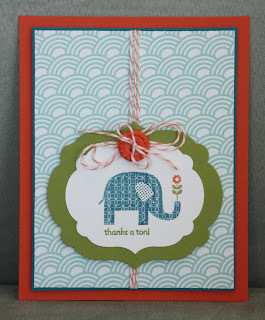 The first card that I am sharing with you today is made using the Feeling Sentimental stamp set. When I first saw this stamp set it wasn't my favorite set, but the more I used it the more I liked it! This card uses Pool Party, Early Espresso and Summer Starfruit. The second card today uses the Patterned Occasions stamp set. My 2 favorite images in the set are this cute elephant and the cupcake. 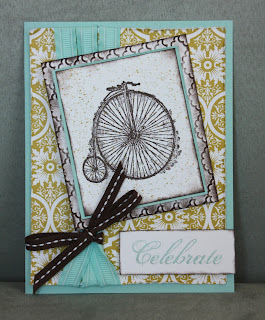 This card uses the Sycamore Street Designer Series paper and Sycamore Street Ribbon & Button pack.